Sarens South Africa lifted a Boeing 737-300 passenger aircraft for South African aviation company Comair. 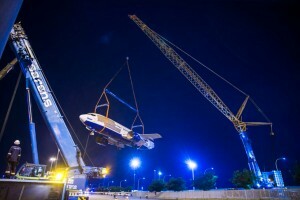 The aircraft was lifted from the OR Tambo International Airport, across the R21 highway in Kempton Park, to the Comair training centre, where the Boeing 737-300 will be used as a real-life evacuation trainer. The plane is 33.35 metres long, 18 m wide and 5 m high and a dead weight of 25 tonnes. Its engines had been removed and portions of the wings and tail had been clipped. To lift the aircraft to its new location, Sarens used a Liebherr LTM 1400, a Terex AC 500 and a Terex AC 200 wheeled mobile telescopic all terrain cranes.The lift was carried out overnight to allow several main roads to be closed. The new training centre will be built around the aircraft.